The Hampton Inn Anchorage hotel is located at Tudor Road and **C** Street in midtown Anchorage which is within five minutes of downtown and the Anchorage International Airport. Area attractions include a 16 screen theatre with stadium style seating a vintage aircraft museum zoo and mall with 170 shops. Within .1 mile hotel guests can dine at Applebee*s Peppermill Red Robin*s or Sea Galley. The hotel provides complimentary 24-hour shuttle service to Anchorage International Airport and destinations within a three mile radius. The Anchorage Hampton Inn hotel features 101 guest rooms including 4 deluxe whirlpool rooms that come standard with complimentary high-speed internet access /both wired and wireless/ coffeemaker hair dryer iron microwave refrigerator and cable TV with complimentary movie channel and pay-per-view movies and games. 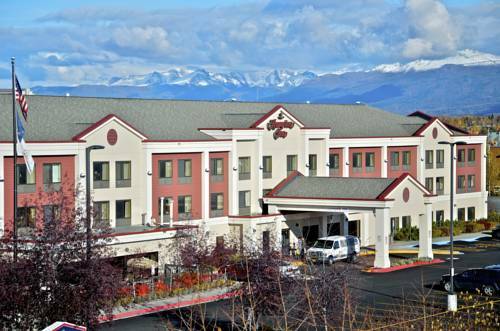 Sure to please the busy executive or leisure Alaska traveler Anchorage Hampton Inn - Suites hotel guests will enjoy complimentary On the House hot breakfast buffet served daily as well as our indoor pool and whirlpool and fitness center. The hotel also offers laundry/valet services guest laundry facility meeting/banquet facilities and audio/ visual equipment for a nominal fee. We love having you here in Alaska at the Hampton Inn Anchorage hotel. All reservations must be cancelled 24hrs prior to host time unless deposit req. If this reservation has been made electronically please cancel it electronically to avoid confusion and a no-show bill. Policy subject to change. SBC Southport Brewing Company Lone Star Steakhouse Outback Restaurant Peppermill Red Robin*s Sea Galley Sourdough Mining Company Stuart Andersons Cattle Co.